Don't let the cutesy faces and fluffy feather tails fool you, they WILL try to destroy you if you enter their territory when we are not around. We had to post the sign a few years back as they tend to corner unsuspecting gate crashers with a great show of bared teeth, deep throaty barking, and a killer stare. When we come out to see what the fuss is all about, they immediately turn into fluffy marshmallow cutesy puppies who are the friendliest things going. Tibbies are very territorial...that's why the Tibetans kept them to guard their palaces...no one gets by a Tibbie without permission. No one. So, go ahead and laugh at the sign...just try to come on in...everyone laughs the first time. Everyone. READING: Indianapolis Monthly magazine as I need to go to the library today and get a new run of books...don't hold your breath, I'm fairly certain it won't be anything you will be rushing out to find for yourselves. FAV NEW FIND; Jan reminded me of the importance of this favorite thing this week. At the Mass for Kelly on Tuesday, all the high school CSC swimmers sat together in a couple of rows of pews. Most of them were in suit and tie and lovely girly type dresses and all of them were there because CSC is like a family and we had lost a dear and treasured member. After nine years with this club, and Jan has been with it for ten years with Johnny, these are the people we see almost each and every day throughout the entire year. The church was packed with swim families. During the Our Father, the swimmers all reached out and held hands, and as a parent, there are just some moments you know you will treasure forever. Seeing all the kids we have known and loved all these years joined thusly, was one of those times. So, while I have always known we are a tight-knit bunch, my favorite new find is just how strong the bonds are among us all through our children. FAV THING TODAY; GUERIN IS OUT FOR THE SUMMER AT 11:30 A.M. YAHOOOOOO!!!!! CHS gets out tomorrow at noon! Let the summer begin! I am so ready for it! SCRAPBOOK PAGES THIS WEEK; None...but tomorrow is a workshop, so hopefully I can do a few then. PRAYING FOR: Continued prayers for Kelly, Donna, Scott, Sarah, and Katie...please join me. Yesterday was the Memorial Mass for Kelly. Not a "funeral," because Donna and the kids wanted it to be a celebration of Kelly's life, and it was that: a chance to gather together, to celebrate Mass and the wonderful person that left us all too soon. The thing about watching someone suffer for a prolonged period of time, and I can't think of too many diseases that come close to ALS in this regard, is that when the release finally comes, there is a great sense of sadness, but also one of intense relief that your loved one is no longer bearing the burden of earthly suffering. I do not think that I have ever witnessed a family who demonstrated more grace than I did yesterday seeing Donna, Scott, Sarah, and Katie at the service, dinner, etc. I don't have a clue how much endurance and fortitude it took for them to present the loving, joyful, compassionate demeanors that each displayed throughout the entire day. Kelly was everything to this family and I don't know how they managed to handle such a great loss so beautifully...grace had to be fully present is all that I can believe. I was doing fairly well in the emotion department, greeting people as we went into the nave, carefully choosing to sit in the very back row, at the very end, so that hopefully none of my weepy friends would want to sit that far back, thereby enhancing my chances of getting through it all dry-eyed. Krystal and Jay (Harrison's parents) sat with us for the same reasons and we all managed to keep dry-eyed (Jay and Mark sat side by side and Krystal and I sat on either side of them so that further enhanced the chances). I was good until the carrying up of the Offertory gifts...Donna, Scott, Sarah, and Katie chose to do this themselves, and as they walked down that long center aisle toward the altar, I was feeling a little teary...when they reached the altar where Father and Matt (as the altar server) were standing, it was all over. There was a family we all love dearly, our priest who we love dearly, and our son, standing in front of Kelly's photo on an easel. Too much. As Father and Matt proceeded to the altar and Donna and the kids to their seats, the hanky was out, and it was a few minutes before I could see clearly again, pictures of years and years of seeing and talking and laughing and working and sharing life's moments raced through my mind. It's hard to say goodbye. Jeff, Kelly's best friend from his childhood and throughout life, spoke beautifully about the legacy that Kelly leaves behind. He summed up his favorite parts of Kelly (besides the "pearly whites" as Kelly had the most beautiful teeth and smile...Kelly was always happy, always smiling) as being these three: First, Kelly was always ready to forgive and forget and encourage others to do the same; Second, Kelly always gathered people together, brought people together who you never thought could ever be brought together...always the loving link between people and groups of people; and Third, Kelly always looked for the best in people, he always found the good in people and celebrated those aspects. Jeff is so right...all these are a great legacy...one we all share and will remember when we think of Kelly in the years to come. It's a legacy for you, too...share it around. It is my second week with the Tuesdays with Dorie bake-along. While time consuming, the recipe is straightforward, easy to follow, and turned out the very first time for me...a big plus in the baking department around here. First, let me say that I am going straight to HELL. These are very very good and one could become lustful of Pecan Honey Sticky Buns in very short order. Something this good, with this much butter and sugar, is certainly a sin! First time around, this recipe is time-consuming, no doubt about it. I can see, however, that a second go at it would move much quicker due to familiarity with the recipe and all the little tricks one knows for doing more than one thing at a time that comes with having worked a recipe a second time. That said, this is now my ONLY Pecan Honey Sticky Bun recipe...all others are flying out of here. Make them. And when you do, make sure that you have company coming, neighbors who are willing to indulge in baked products, two ravenously hungry teenage boys, and one very sweet husband who has had a love affair with pecan sticky buns for years and years, because temptation will run its course with these...truly a great recipe. Definitely a keeper. It's a tad difficult being in a festive mood for a wedding while in one of the opposite nature for mourning. It's all that compartmentalizing one must do to navigate sanely in life, I suppose. "This" goes here, "that" goes there...my love of organization can usually take over quite easily...odd occasion or two where it cannot, but for the most part it is the right thing to do...compartmentalize, get on with life as best as you can, hoping it all shakes out okay in the end. and the last one of our nephew Steven because at any reception, the end shot always looks something like this with the little ones dozing away long past bedtime...just a few that stood out to me as most of the reception photos fit into these categories: Too far away, Too dark, Too light, Too blurry, Too many people, Too few people, Too much of people not looking like they normally would like to look in a photo to be posted, Too much of people looking exactly like they normally look while drinking and dancing at a reception and therefore probably not kind to post them, Too much red eye, Too much, Too much, Too much...so here are just a couple of favorites. Mark's sister, Nancy, hosted a picnic on Sunday at her home, so here are photos of the Big Guys and the Little Guys. The Big Guys (minus Brian, of course who was busy with post-wedding duties at home), reading from left to right: Luke, Alan, Mark, Nancy (well, Nan is not a guy, obviously, but she has been outnumbered for years and years), and Philip. The Little Guys (also known as The Nephews by Aunt Nan), reading from tallest to shortest: Andrew, Matthew, David, Alexander, Jonathan, and Steven. These are the boys Aunt Nan takes on vacation with her each summer. It's good to have an Aunt Nan who has endless amounts of energy and patience for little boys and gives so willingly of her time, treasure, and talent for accommodating such adventures. This last photo is for Alexander. Yes, Alex, here is proof that "It does so matter that the cut grass be either bagged or raked each week." Note our lovely yard with the clumps of dried cut grass looking so untidy and unsightly...dontchathink this photo would be much nicer with those missing entirely? (This is not a rhetorical question.) We could do a vote on this, but I would win either way, so there really would be no point in it. Next week's view: Kindly bag or rake the grass and I will be forever appreciative and thankful...and so will your buddies when they come to swim and do not end up with dried grass all over their wet feet. Thank you ~ From the Assistant Supervisor of the Grounds Management Team. In Webster's Dictionary a "hero" is defined thusly: "a man admired for his achievements and noble qualities; one that shows great courage..." If you asked my two sons who their hero was, they would say, "Kelly." Hands down, Kelly has been the hero around here for the past four years. Maybe longer, actually, as we have known Kelly and his family for the past eight years: our children swim together with CSC, we attend the same parish, we live on one side of our church, they live on the other, separated only by one of the few remaining farm fields left in Carmel. 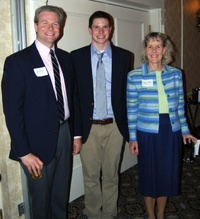 Through all these years, Kelly's devotion to his family was first and foremost the very definition of his life. Where his kids were, you would find Kelly. If the kids participated in something, Kelly was not only there, he served on the board, he volunteered, he shuttled his and everyone else's kids to and fro, he balanced work and play like it was a picnic every single day. Cheerleader extraordinaire for not only his kids, but all of our kids. Always. The support and encouragement each person gained from knowing Kelly was continuously present, the very essence of himself. In life, each person has a moment when they learn of something that suspends them in time, a reference point from which they can always and forever draw from that moment on. My first experience with this was seeing my father alive for the last time when I was 5. From there I remember my First Confession, My First Communion, the day JFK was assassinated, and on and on throughout my life with various other things. And so it was, that such was the case when I stood beside our friend Kelly chatting about the day-to-day bits of life and he turned to me and said, "Kayte, when I went to Mayo Clinic, I found out that I have ALS." My father's sister had just died from ALS, so I was not unfamiliar with the disease...my heart sank. I don't remember what I said, but I know there were tears in my eyes as I looked at him. He said, "You know, I don't care for myself as I have had a wonderful life, a full and rich life, experienced all the joys that one could hope to experience. But, I do care for Donna and the kids. Donna will need to be a single mother and my kids are just so young. I will miss so much with them. That's the part that I just can't come to terms with yet." His kids...Kelly was always all about the kids. These past years he has spent in progressive decline with the ALS, but he still attended as many of the activities as he could, for and with his kids. In the early stages of ALS, right on through his last days, he was intent on making each and every day count, really really count. We all learned much from this. My boys learned how a hero handles a life lived in preparation for something completely out of one's control with grace, dignity, and joy, and with extreme love and concern for everything around him. Late last night, Kelly lost his battle with ALS and slipped quietly away surrounded, as he had so hoped, by his family, at home. All these years, I knew eventually that the call would come, that the loss we would all feel would be great, but when the phone rang at midnight (never a good sign when our phone rings at that hour), and I heard the words, "Kayte, Kelly has just died and we need you to help with the arrangements, can you do that," I still could not register the words and what they meant...sleepiness or denial, I am not certain, but I never ever think things like this are actually going to happen, and I am never prepared. Is anyone? I always think the sensible, practical, organized side of me will instantly spring to life, but it never happens like that...I am always a little dazed and groping before saying, "Yes, yes, what do you need me to do?" After an hour or so, things well in hand, I hung up knowing what I could do, and more frustrating, knowing what I could not do...I could not bring my boys' hero back to life. Today, as I move about the motions of helping where I can, I know that I don't need to bring him back to life...that once a hero, always a hero, and that Matt and Alex will remember this man always and that his life will have affected theirs in a way that will honor his memory for as long as they live. Please join me in praying for the repose of the soul of Kelly. Please pray for his wife Donna, and their children, Scott (16), Sarah (15), and Katie (12). And, if you are able, May is ALS awareness month, please donate $1 or $5 or $10 or $100 or whatever you can in Kelly's memory. http://www.alsa.org/ Thank you...your donation makes you a hero, too. Rest in Peace, Kelly, you will be dearly missed by us all. I got to spend a decent amount of time knitting at the swim meet last weekend, so I completed another market bag (not pictured as I figure you are all getting tired of those...but I am not...I love making them, such fun), knitted until I got stuck on the pattern directions for the golf club head covers, started a beanie type hat for Matt for when he has a shaved head and comes out in the cold after swim practice (per his request), and also started a baby blanket for a recent arrival of the blue variety. (This will be a sort of denim-looking blanket meant for car travel as we always found it useful to have a separate blanket for the car for the boys in summer as well as winter due to the air conditioning being cold on their bare legs, etc.) So the photo is all this laid out as nothing is complete, but I do have a lot going on. It seems to be rather helpful to have a lot going on so that if one thing is at the "stuck" stage, there is something else to work on (until it also gets in the "stuck" stage). Lin, my knitting instructor, can always solve all my "stucks" at class in a matter of seconds it seems. It is very important to have a Lin in your life when attempting something crazy like knitting. It is enjoyable to be learning all the new bits and pieces for each type of item. I'm having fun with it all, truly, I am! Okay...it's sunny, it's warm, dinner is all ready to go, all I need to do is run to the pool to pick up Matt, finish, serve, and eat the dinner (I love grilling season as Mark can grill every night...and he is very good at it), and then head out to the golf course. I can knit when I get home, and read before bed, and as I fall asleep I can think, "Wow, this was a great day...and nothing special even happened...it was just a great day!" I so don't deserve it. But you do...so I hope you had one, too. When I arrived home from the swim weekend, I found my acceptance email from the Tuesdays with Dorie bake-along blog and instructions for the first recipe. I got really lucky on this first one as it was for Madeleines and I just happen to be the proud holder of a Reserve Grand Champion honor and ribbons from the Hamilton County Fair for my Madeleines. Yesterday I used the recipe from Dorie Greenspan's Baking: From my home to yours cookbook (you can find the recipe on pages 166-168...a simple recipe, but covers three pages in the book with chit chat and a very large photo, etc.). Note: Since Dorie has the cookbook copyrighted, I will not post the actual recipes here on Tuesdays (part of the deal on the blog is that everyone has their own copy of this cookbook, so I figure to honor that, I won't post the recipe...others on the blog are doing so if you want to check it out, however). I found her recipe similar, but maybe not quite equal to the one I have used before...it does produce a very delicious Madeleine with just a little amount of effort, so I would recommend this recipe for anyone wanting to try it. The girls at MNO last night had a sample and declared it "very good," and they are a great judge of things along this line. While this recipe was not a big learning experience for me, I will share here my feelings on Madeleine pans as I definitely have strong feelings on those. 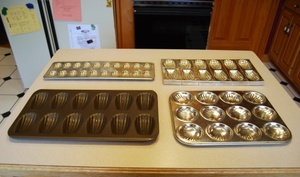 When I was first making Madeleines, I purchased a Madeleine pan, or what I thought was one, and it was labeled as such. It is the rectangular one shown here with the round cups. (You can click on the photo to enlarge it.) It sorta kinda maybe has a somewhat perceptible shape of a shell, the traditional Madeleine shape. Don't buy this pan. Really. It does not imprint the shell shape and the little sponge cookies all just look like circles. I have only kept it because sometimes one just wants a little round shaped cookie and it works great for that. The second pan I bought was the non-stick coated pan you see with the darker finish. Don't buy this pan. Really. It imprints okay, but the non-stick coating causes the outsides of the Madeleines to cook faster than the insides, therefore leaving the Madeleines a little tough by the time the inside cooks. You don't get that nice soft airy melt-in-your-mouth cookie when you cook it that long. I don't know why I still have this pan as I don't like using it...if you think you might want it, let me know, and you can have it...really, just say the word and it is yours. You might like it fine...me, not so much, but I am rather picky (shocker, right?) about these sorts of things. The other two pans shown are my favorites and produce a very nice Madeleine with just that little tiny bit of crunchy edge around the outside that I love...the little crunchy edge with the soft middle is perfection in my book. The pan for making mini-Madeleines you need to watch carefully, so they don't over cook, as they are small and can easily get away from you if you aren't careful. Dorie's book recommended cooking the large ones from 11-13 minutes and the small ones from 8-10 minutes. This is too long in my oven, so you might want to play around with the time when you cook yours...my large ones take about 10 minutes and my smaller ones take about 7 minutes to make them nice and soft. (Pretty much I take them out when they look set and I begin to smell them baking.) All baked goods continue to cook just a little more when they are cooling, so there is a trick to knowing when to take them out for the best result. 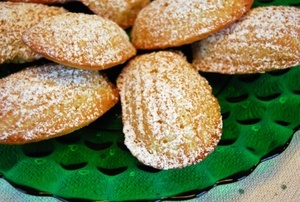 Remember to sprinkle the powdered sugar over the tops of the Madeleines after they are cooled or the powdered sugar will melt (unless you want it to melt, of course). Next week's recipe is Pecan Honey Sticky Buns on pages 51-53 of the book if you want to bake along...you don't have to be a member of the baking blog to do so, you know! A link to the blog can be found at the left sidebar here at GKT. If you click on the baker's sites along the left side of the Tuesdays with Dorie blog, you can view their photos and thoughts...and some of them have posted the recipe as well. Now...about that non-stick pan...anyone? Anyone at all? Back from the Purdue meet...some successes, some not so much. Matt swam the butterfly (pictured here with his golf tan) and had no problems with back or shoulder doing it, so that was nice. LOTS and LOTS of college guys in this meet, so Matt was seeded way down on the list, but very high for the 15 year olds entered. He added time in some things, dropped in others...it's early in the season, so this was a good meet to go and see what we have and where we are going with it. I always think our 15 and older swimmers look so old and mature these days...until we swim with the college kids and then I think, "Well, we aren't so old and mature after all...."
Warm-ups or goofing off...sometimes it is hard to tell. (Matt and Ali by the white wall, Ali with her white hoodie on and Matt beside her, Mike thrown in the mix in front.) 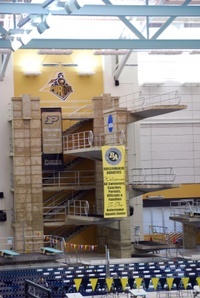 Purdue (and I am an IU person, so this takes some muster to even admit this due to the IU/Purdue state rivalry that goes on) has a beautiful, wonderful, excellent swimming pool facility. It is just gorgeous. Huge (not by Nat standards in Indy, of course, but anywhere else), lots of open space, very high ceilings, two walls of windows, a diving well that is just lovely and fun to look at, excellent seating stands, plenty of room, plenty of space behind the stands where people can stand and watch and not be in anyone's way, very clean, very well run...I can't say enough. I wish all our meets were there. I LOVE that pool. And, more importantly, so do the swimmers and coaches. When one spends three days somewhere, it's a good thing to love the facility. I got a LOT of knitting done at the meet (oh, I just love this knitting thing at meets). Murph, on the other hand, worked on his laptop most of the time...I asked him to flash me a smile for a photo, so he held up his hand with his smiley face admittance stamp on it. Murph makes it so much fun at meets as he has a great wit, so it's good to get a seat by Murph. He is just full of all sorts of useful, and often silly, information. Mickey graduates this year, so our days with Murph at meets are coming to a close soon. Shucks. In the evenings I visited with the swimmers and read my books...not a lot of parents around as it was a travel meet where the kids all went up together...and those parents that did go like to shop...enough said on that. 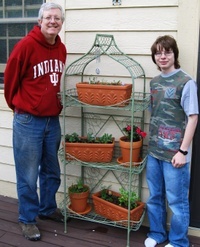 (Photos are Scott D., Mickey, and Matt; and then one of Matt and Harrison). 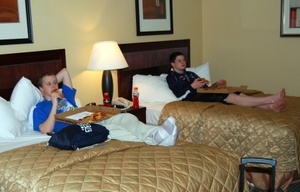 Last photo here is Matt rooming with Johnny and vegging out with a half a pizza each while watching a little television and winding down from the first day of the meet...Matt swam three events that evening, so he was really happy to see that pizza arrive. When I returned home, Mark had mulched all the plant beddings in the entire yard, front and back...what a lot of work for him alone. It looks very nice and it especially looks very nice since I didn't have to do a single bit of it. I definitely got the better end of the deal this weekend by going to the swim meet. Today I hope to get caught up around here, have volunteer work this afternoon, and MNO tonight...it will be great to see everyone. Still cool, but sunny. Big fancy wedding to go to this weekend...this time of year, one always has lots of choices of grad parties, weddings, showers, First Communions, Confirmations...something going on all the time...difficult to choose...which one, which one, which one??????? 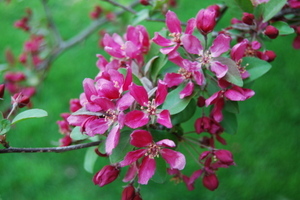 A photo of the pretty pink flowered branches on the crabapple tree in the backyard. It is right outside our bedroom window, so each morning I get to wake up to the beautiful flowers brushing against my window. Lovely, just lovely. READING: Well, I finished reading my book last night, so now I am just a giving the Dorie Greenspan Baking book a once-over. The girls on the blog have already made more than a dozen of the recipes, so I am giving them a glance to see if I want to retrace that path and make a few of them. Need to get to the library tomorrow so I will have some new historical fodder for the weekend at Purdue...can't go without a book or two dontchaknow. LISTENING TO: Gustav Mahler, a man never appreciated in his own time, so it's only fair we give him his due every now and again. COOKING THROUGH: Dorie Greenspan's Baking: From My Home to Yours...stay tuned, I will let you know how it goes. FAV NEW FIND: Highlight tape of differing colors...wow. This is great for knitting patterns because you can place your pattern in a plastic page sleeve and the tape can be used over and over to mark your place in the pattern as you go along. Very nice. FAV THING TODAY: Well, it sure isn't the weather, letmetellyou. Enough with the rain already. I think my favorite thing today was the day spent substitute teaching at Guerin. It is fun to see the kids and enjoy their high levels of energy. 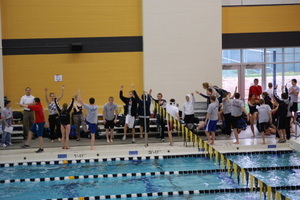 GOING TO: Three-day swim meet at Purdue. Alex has a scout canoe trip he is looking forward to this weekend. PRAYING FOR: This is difficult to explain because my heart is always torn. I fully believe that the people living in our country should take the proper legal steps to be here. I always feel a little guilty that I am lucky enough to live here while others live in places I can't even imagine as they are so unbelievably hard/tragic/poor/unhealthy/etc. This past Monday in Postville, Iowa, the immigration people raided a meat processing plant and arrested something like 400 illegal aliens who worked there. (I know, this happens all the time, but this was close to home, was a place where fellow students of mine in high school all worked during the summers when they were home from college, is a town that is home to several of my friends from high school, etc., and it is being touted as "the largest raid ever undertaken in the US.") The townspeople have mixed feelings as their small farming community has seen an influx of these immigrant families in recent years, making up about a third or more of the town's population. The part that tears at my heart is that they rounded these people up (primarily men), loaded them up in buses, and shuttled them off to the Cattle Congress grounds in Waterloo, Iowa (okay, they housed them in the ballroom there, but still...). The hearings have been going on way into the night. Many of the men don't speak English, their families do not know where they are or what is happening to them, their children are left in the care of whoever will look after them while the wives try to find out what they can about their husbands, brothers, friends. And, yes, I know that they are all here illegally, have used false identity cards, usurped social security numbers, etc....but those little children...my heart just goes out to those little children. So, for this week, my prayers are for those people, please join me in any way that your heart feels it can do so. It just feels like a "no win" situation...prayers always feel useful to me in times such as these. Today's little photo is something that happens almost daily around here. We have a little "policy" that the person who empties the milk bottle is the person who should rinse the bottle and leave it to drain. Believe it or not, I have seen the milk level fall even below this paltry line and still be occupying space in the frig. I am sure you can figure out the reason for that...please tell me that these boys will grow up to be productive members of society with three digit IQs and a conscientiousness that will ensure a safe arrival and pass-through at the Pearly Gates. I am starting to have doubts. No recipe today as it was a crazy busy day and when I finish posting this, I am hiding out with my book until sleep overtakes me...it is rainy and dreary here, so that seems an okay occupation for the remainder of the evening. Okay, I saw this next idea a bit ago and I was thinking, "How fun...," but then I figured that this would involve a lot of chocolate commitment and I thought, "Not so much me," as I really am not a chocolate fan. I kept thinking about it, because my family tends to be big in the "I Love Chocolate" department, and a good wife/mother would try to accommodate such things in an ideal world. Soooooooooooooo...I did it. I signed up at the Tuesdays with Dorie food blog to participate in the cook-along each week (I think the requirement is actually only twice a month, but you all know how compulsive I am, so I will probably try for the weekly thing). http://tuesdayswithdorie.wordpress.com/ The premise is that members in the group (and it is a hefty group at this point) select and bake the same recipe each week from Dorie Greenspan's Baking: From My Home to Yours cookbook and then post about it on their own blogs. You can check the other participants' blogs if you like, or not. I don't know...this could be sorta fun, so I am giving it a whirl. I tend to just bake the same things over and over, so this should inspire more of a variety, which my guys always love and appreciate...reason enough. Have a great evening...I'm off to get into my jammies, stack up about six fluffy pillows, throw on a comfy quilt, adjust my reading lamp just-so, and spend the rest of it reading, reading, reading! Brrrr...it is cold here tonight! My goodness, these Tuesday craft days at the Table come around quickly each week. I made three more market bags...for Shelley, Karen, and Susan as they expressed so sweetly how much they really would love to have one. Shelley's was the pastel color combination of the one I made for The Lovely Tess last week. The ones for Karen and Susan are like this one pictured at the right...a blue, purple, turquoise, pink combination that I just loved working with and may need to make one in that color combo for myself. Yep, may need to do that. 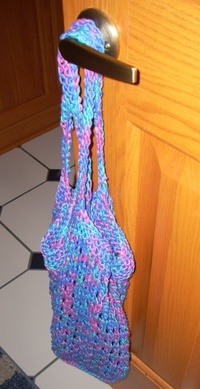 The handles on these bags are different as I did a little experimenting and decided I liked the way these carried better for Karen and Susan's bags for the way they wanted to use them. Who knew I would be able to alter and adjust a pattern and have it turn out? It just gets better and better, I tell you. Love it, love it. I am also working on the golf club head covers, but do not have one completely finished yet, so that will need to wait for a peek next week. The last photo is evidence of the grief to which I am being subjected to from my non-crafting friends. At Book-It Shelley sketched a little "sign" for me on a napkin about opening up a crafts boutique of some sort...all in jest of course...so here's her little sign, complete with the country painted flowers, wooden-look lettering, and dressed up goose (with extra long legs just for me). They were all teasing me about being "really scared" of this new part of me and threatened that if I took up macrame that they would call the men in white coats. Can you believe I am being subjected to this sort of abuse? I can...I figured it was coming...but someday, when they are all thinking, "Hmmmm...maybe I should learn to (fill in the blank with a craft).....," I will be very kind and just smile sweetly. Do you hear that Shelley, Katie, Margaret, Debbie, Jerri, Anne C., Anne G., Kimarlee, Gloria, etc.? Sweetly...I will smile nicely...because when it hits, it is addicting! 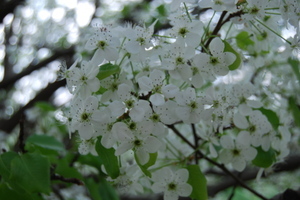 Pretty little blooms on the dwarf crabapple tree by the garage. Not a spectacular swim meet this past weekend. Many reasons for that, apparently. For one thing, it is the first meet of the long course season, one where the coaches tend to toss the swimmers out there, let them swim, try a bunch of new things, and see what happens. A learning bout. Some things successful, some things not. One of the least popular bouts this weekend, at least with Matt, were the warm-up sessions each day of 4,000 meters, instead of the usual warm-up sessions of 600 meters...big difference, especially to a sprint swimmer like Matt (distance definitely "R not us"). Swimming the equivalent of roughly two and a half miles before the meet each day is really not the most ideal way to insure success of a sprint swimmer, that's for sure. The lanes were at least half stocked with CSC swimmers for each event, so that did not inspire a lot of competitive drive, coupled with the fact that there were no time standards to enter this meet, so the more advanced swimmers just saw this as mainly a sort of "practice as usual" rather than "swim as if your life depended upon it" meet. Throw in a little "off time" for the change in pool configurations from yards to meters between short and long course season, trying to factor in longer distance, change in turn increments, etc., and the first meet of the season often gets counted as not much of anything. 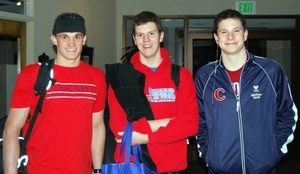 All that said, Matt did drop 12 seconds in the 400 Free and another 6 seconds in the 200 IM. Those are the Ups (if you are thinking in terms of being a good thing). The Downs (if you are thinking in terms of being a bad thing) were everything else, as he added time in the 50, 100, and 200 Free, as well as the 100 and 200 Back...all his swim specialties, as it were...definitely not a good thing. No photos as he was not really wishing this to be recorded for any sort of remembrance...but the upcoming weekend we head off to Purdue for a fancy meet, and hopefully the results this time next Monday will be a whole different story. Keep thinking those good thoughts! The IYC concert on Saturday afternoon went well, the Vivaldi difficult, but excellent results. Dinner at Grandma and Grandpa's in Elwood was also a very nice time with various siblings, spouses, children, etc. Definite lack of photos from the weekend...what can I say? I was just totally negligent in the photographer role. I'm sure I will regret it sooner rather than later. Lunchtime is almost over and I need to get a move on outta here...you know the drill -- go out and do something special for someone today. Oh, and don't forget to appreciate all the green...be still my heart...lots of lovely, lovely green everywhere one looks these days. It was a long time coming, so I want to be certain to give it it's proper due. Have a great week! Am subbing at Guerin today...Math... (I hear you moaning, Meg, as I know how you love Math), but am home for the lunch period and a prep period (and to let the dogs run in the yard a bit), so thought I would blog a little here to count for today as after school until way late I will be working at the swim meet. 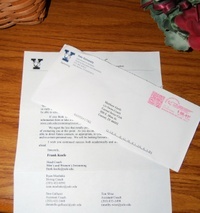 Matt has gotten letters from colleges before about their swimming programs, but yesterday he got a fancy one from YALE! Good golly...Matt is only a freshman and we didn't think we would see anything like this for a couple years yet. Basically the letter says, along these lines, "Congratulations on your swimming accomplishments. NCAA rules prohibit us from sending you any information about Yale University and the Bulldogs Swimming and Diving program until you are a junior. However, we are permitted to invite you to join our mailing list, joining other students who contact us early and express interest in learning more about Yale University. If you are interested, please complete the enclosed form and return it to us. We regret the less than totally personal nature of this letter, but it is our best way of contacting you at this point....." Now, how fun is this? Matt was just thrilled. It goes up on the Bulletin Board as inspiration...an Ivy League college sending Matt an "are interested" letter as a freshman with no solicitation on his part whatsoever. Maybe this swimming thing is a good deal after all. He swims the 400 Freestyle tonight...he hasn't entered in that for almost a year, so we should see a good cut in time, always inspiring any way you can get it. Back to Guerin...catch you later. READING: Jane Austen's novels as I watched the movie Becoming Jane (twice actually because I always get more out of a second viewing). There were a few places in the movie that made me think along the lines of where she inserted this or that in this book or the other, so I just figured I would indulge and give them all a quick read again. (Okay, I confess...I read them all every couple of years as I just love a good happy ending.) I know you are all surprised, as I rarely read novels, but I am thinking this might just qualify for that little New Year's Resolution about me reading something "identifiable by the general public with no redeeming value or quest for higher knowledge," and I so love doing something once and counting it toward at least two goals. Today is Emma. LISTENING TO: Bachman Turner Overdrive...blast from the past...forgot all about them until recently. FAV NEW FIND; Three new knitting items: Sewing Gauge, Safety Pins With No Coil (so the thread does not get tangled in it), and a Stitch/Row Counter...gadgets to make the whole process more easier and fun. And, yes, I can hear you all laughing as you ALREADY knew about all these things. I'm a newbie, remember??? Loving it, loving it. FAV THING TODAY; Well, yesterday...the entire 25th Anniversary Ordination Mass, celebration, etc. It was all wonderful. But my favorite part, hands down, and there were many favorite parts, mind you, but my favoritest of the favorite (and yes, I know "favoritest" is not a word, but I like it anyway), was watching Matthew serve the Mass as the head altar server. As I was watching him, I could see him at 9 and 10 and 11 and 12 and 13 and 14 and 15 serving so reverently and beautifully. Last night he was taller than all the priests in attendance (about 100 of them...so many I couldn't count without saying, "Okay, everyone line up and number off..." and I wasn't about to do that). I was actually doing fine in the emotion department until Matt was incensing Father and then in turn, the other priests. I felt a huge lump in my throat and my heart was full of every good emotion possible at the sight: Matthew in his altar server robe, standing on the altar, incense bowl gently swaying back and forth toward the priests, each of them bowing in unison...no camera...I will just need to remember this one in my heart. Definitely a Favorite Thing. 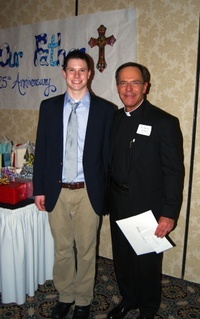 (Photo is of Matt and Father Brian D., a priest who was at our parish for three years and had a tremendous amount of influence in training Matt to be the excellent altar server that he has become...Father D. put a lot of time and effort into making our servers really wonderful. 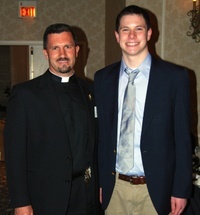 He now has his own parish in Hamilton County, so we get to see him occasionally, which is very nice.) And where, you might ask, are photos of Mark and Alex from last evening...well, Mark and Alex parked themselves at a table near the refreshment table and chatted from that venue...eating munchies and sipping sodas...and Matt and I motored about chatting with everyone, so the camera didn't capture as much as I had hoped as I always take about ten photos, and then forget I have the camera in hand...someday I will do better about this...hopefully. SCRAPBOOK PAGES THIS WEEK; None..yikes, spent all my craft time knitting instead...oh, I am so addicted to carting this knitting everywhere...why did I not think to do this earlier? Oh, right, I was homeschooling and I carted books, papers, etc. with me everywhere and worked on those in odd spare moments of waiting, etc. A different season of my life now. GOING TO: Three-day swim meet Friday, Saturday, Sunday...also Matt has an IYC concert on Saturday afternoon, so he will need to exit the swim meet after his last morning event, don his tux, and slide into the venue for the concert barely dry. Looking for us? Check the pool as CSC hosts the meet, so that means we work as well as watch. 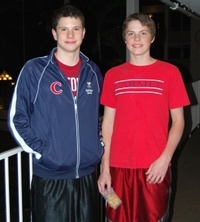 Good times...please keep a few good thoughts for good times, especially in that 100 Backstroke, as Matt is so close to the Junior National time and is working especially hard for that one. PRAYING FOR: Last night I chatted with so many people, and heard so many prayer requests, that my head is reeling from it all...so this week, just pick something near and dear to your heart, and pray...and please join me: go out and do something special for someone for no apparent reason whatsoever, and this time, tell them I sent you and to play it forward. Have a great weekend! I decided that it was too much fun to make just one, so I made another for The Lovely Tess to use this summer as a swim tote bag...to tote her suit, towel, sunblock, etc. to the pool. The Lovely Tess, although only 15 and in high school, has her own little crafting business called Kromar Kreations that she owns and operates with her sister. She crafts silverware with beading. (Very difficult to explain this, and I don't want to photograph it here as I don't know of anyone else who has come up with this idea. I would not want anyone to "borrow" Tess' idea from this site since it is very unique.) The Lovely Tess made for me a very special dessert serving piece for my birthday, so I thought I would craft something for her as a surprise. (It is pictured here on the right.) I sent it with Matt to give to her after her Lacrosse game this evening. I hope she likes it! This week in knitting class we are making golf club head covers...I have been wanting to make these since I first saw some on another blogger's site more than a year ago, and now I am going to get the chance to make some...can't wait! Maybe I will have at least one completed to post next week. Earlier today, Patty and I had a good time up at Guerin setting up the Staff Appreciation Luncheon in the teacher's lounge...Patty being her crafty self made very pretty flower centerpieces...a nice photo of Patty before we started working away this morning. The day has been long, the evening almost at a close, and tomorrow is going to be one very hectic busy day, so might not see you here until Thursday...in the meantime, go out and do something special for someone for no apparent reason whatsoever...and you don't even have to tell them I sent you. Good night, everyone. 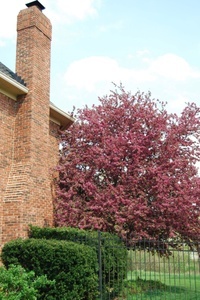 The flowering crab apple tree in the backyard outside the family room window...it is so beautiful with all these pink flowers...I just want to sit each day and gaze at it as long as possible. Is it GREEN in IOWA yet??? Good evening...busy day, how about there? Carmel had a day off school today, so Matt's early morning swim practice was just for the non-Carmel High School swimmers in his group (i.e. Matt, Daniel, Stevie, Harrison, Ali, and Sarah) as the CHS swimmers got to sleep in a little and practice later. I had the parking lots and lanes all to myself when I dropped Matt off...I could have spun wheelies if I wanted to (not that I really wanted to, but I could have!). Alex surfaced around 12:45 p.m. since he is a Carmel High School student...how on earth do teenage boys manage to sleep this much? I cannot think that I would ever have been able to stay asleep past the hour of 7:00 a.m., or possibly 8:00 a.m. at a real stretch...it must be one of those "guy things." He wanted Chinese food for lunch, so we went off for a nice lunch together and then ran a few errands, filling up the gas tank, etc. (OMW). Matt had no afternoon swim practice due to the change about in swim times for the day off, so we went to the yarn shop to get more yarn for me...I am becoming a knitting fiend, let me tell you. (While Matt is not all that shot up about looking at a lot of yarn, he does rather enjoy chatting with the lovely high school girls who work there after school and on weekends, so it has never been a problem to get Matt to swing by the yarn shop, which isn't that far from his school, for supplies...how fortunate is that little deal? 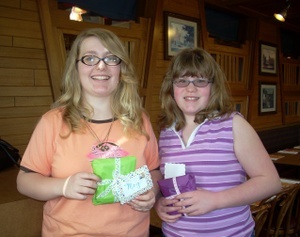 They are nice girls...two swimmers and then a couple of homeschooled girls, one of which he knew when he was younger.) Swim meet this weekend, so I wanted to be sure to have yarn so I can knit. You heard it here first. We had a light dinner and then Mark and Matt went golfing (surprise, surprise, right? ), while I made tons of pasta salad for the Staff Appreciation Luncheon at Guerin tomorrow. All that is left to do is write 21 thank you notes for my share of the notes, and then I am retiring to read a most excellent book until I can't keep my eyes open any longer...oooh, can't wait for that! Tomorrow is a crazy busy day so don't look for my craft day post until after dark. It will be luminous! Overcast with bouts of sunshine today...a little rain in the mix earlier. 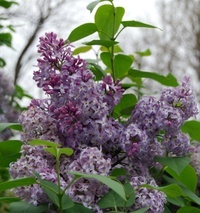 Pictured is my lilac bush in bloom. 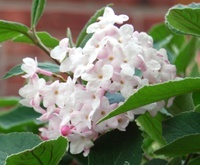 I snipped bunches for the house, too! Pausing for a few minutes to just say hello and catch up on reading some of your blogs. Nice enough out today to grill dinner, but not nice enough for golfing. Probably movie night...what's up over there? Matt's day started with early swim practice. 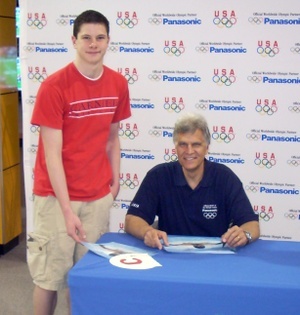 The team got to meet Mark Spitz (got their photo taken with him and received an autographed photo from him, as well as an autographed Carmel Swim Club swim cap). He spoke to the swimmers on inspirational topics, the most interesting to them being the ones about swimming, of course. Matt then had a bit of time off before he headed down to Indianapolis for an IYC choir rehearsal and concert...he will be returning somewhere around 10-11 tonight. This is our last free weekend for the four of us to just hang out with nothing in particular to do until after Labor Day in September. No doubt at one time or another this summer, one or more of us will be traveling to your area as I spent a good portion of a day this week booking accommodations, travel, etc....see you then! 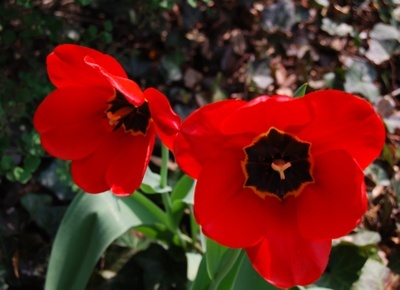 Two beautiful tulips we finally got to grow in our clay soil...aren't they just gorgeous? READING: Catch-up week of lots of bits and pieces and things I have put aside to read. Whew...making a great dent in all that...spring cleaning the reading material! LISTENING TO: Bob Seger (only because two of you were listening to him last week and I figured I would pull Bob out of the dark recesses of time and give him a whirl also...it was a good listen). FAV NEW FIND: Stitch markers for knitting...cool colors, very helpful, useful, and they might even work for ponytail holders in a pinch. (Oh, and if you don't use them, and lose count, then you need to start over...not my favorite by a long shot.) Wait until you see my market bag! FAV THING TODAY; Every blooming thing...and I mean it...everything blooming is my favorite thing for the entire week and then some. SCRAPBOOK PAGES THIS WEEK; Sorted digital photos and got them ready to go to the printer...I am making a new resolution NOT to let these build up so long. Once a month, I am copying them to cd to print. From this day forward.